Pour half a bag chocolate chips into a tall microwave-safe mug and microwave at medium power (50%) for 1 to 1 1/2 minutes. Stir until mug no longer feels warm. Add remaining half of chocolate chips. Continue heating at 15 to 30 second intervals, stirring until smooth. Dip the pretzel into the chocolate leaving about 2- inches of the end exposed. Let excess chocolate drip back into mug. Place the pretzel onto a cookie sheet lined with wax paper. Repeat until all pretzel rods have been coated in chocolate. Melt remaining bag of chocolate chips as needed. Place white chocolate chips into a microwave-safe bowl and heat on medium power (50%) for 30 seconds. Stir until bowl no longer feels warm. Continue heating at 15-30 second intervals, stirring until smooth. Dip a spoon into the melted white chocolate and drizzle or swing the chocolate over the pretzels making little contrasting white lines over the dark chocolate. Once all of the pretzels have been decorated to your liking, refrigerate to set. Keep the pretzels in cool storage. These make a nice gift. Wrap each pretzel in cellophane and tie with ribbon. Serve pretzels in a clear wide-mouth jar or arrange on a large plate or platter. 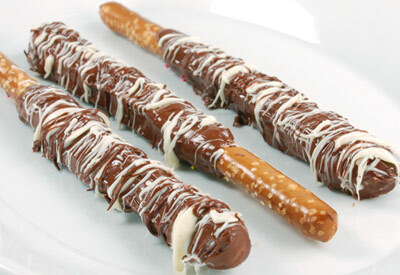 -Dip pretzels first in white chocolate, then drizzle with milk or semi sweet chocolate. -Immediately after dipping in chocolate cover pretzel with colored candy sprinkles.